1. A Clean Environment. Does it look like everything has a place and the school is cleaned daily? 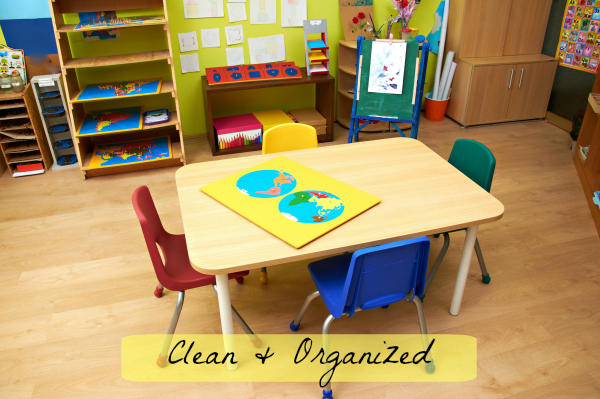 An organized and clean environment is essential for learning. It is also a good indicator that the teacher cares and is also very organized in her teaching. 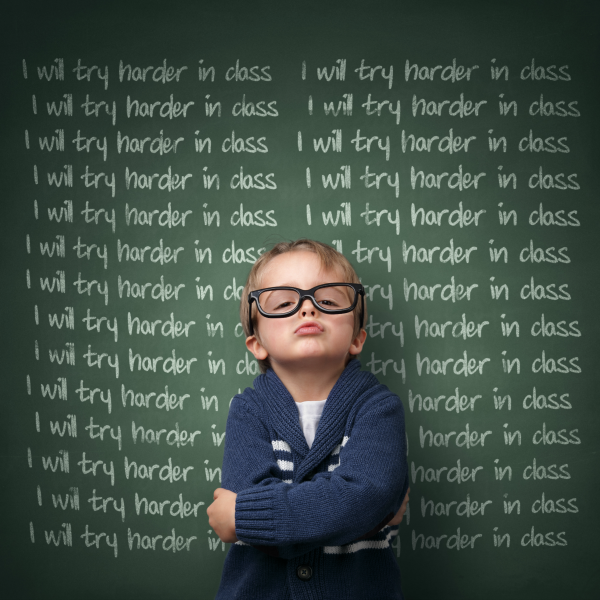 Can a teacher still be incredible without a perfectly organized classroom? Yes! 2. Happy staff. Find out from others what the corporate office is like and how the teachers are treated. It might be tricky to get this info if you don’t know someone who is directly working with the school but I found this to be HUGE. If the teachers are stressed out and aren’t happy working there, it can trickle down to the kids. Most parents don’t think about this. If it is a small preschool, and you don’t already know the owner, find someone who does. 3. Curriculum. Ask tons of questions on this! Do they teach phonics or sight reading? Personally, I am a fan of phonics! Do they have snack time? How long do they get to play? Do they use music to teach concepts? How do they teach art? Do they just give the kids coloring pages or do they actually teach them to paint and do crafts? Do they teach them to write the letters the same time as they learn them? (very important) How important are academics? Some preschools are mostly focused on letting the kids play and have fun with a few academic lessons thrown in here and there. For some children, this is enough. If it were me, though, I would want my child to have fun while learning as much as possible! Both of the preschools that I taught in, had over 75% of their 4 yr old students reading by the time they left. What a great head start for kindergarten! 4. Discipline. How is good behavior encouraged? How is disruptive behavior handled? I, personally, would want a school that focuses more on encouraging good behavior than always focusing on what NOT to do all the time. Even the most disruptive and mean child can have a great experience at school if his teacher knows how to look for the good qualities and praise, praise, praise! The more attention they get for the good behavior the less likely they are to keep repeating the not-so-good. 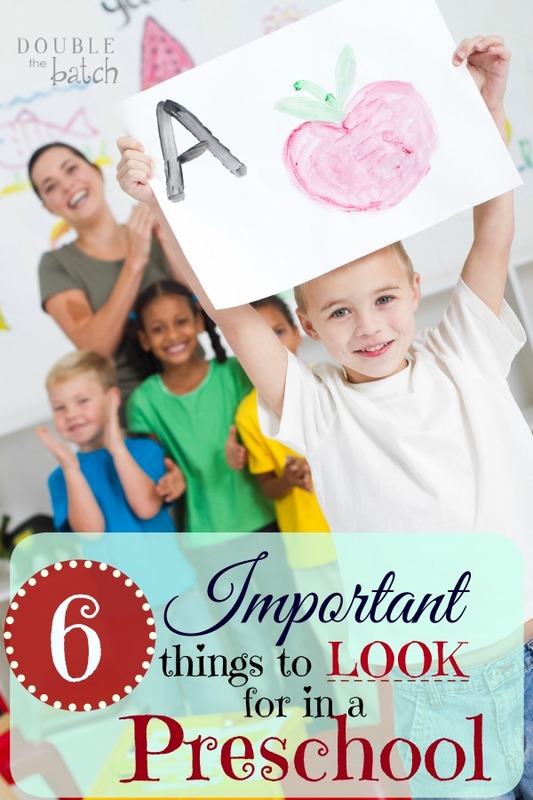 Ask them specifically what steps they take when children are not following rules. 5. OutsidePlay. Hopefully, there is a time set aside for outside play. Check out their playground equipment and ask yourself if this is a place where you would want your kids to play every day. It needs to be safe, inviting, and fun! 6. Small teacher to child ratio. In my 9 years of teaching, I had lots of experience with both. Some of my classes had up to 26 students with 2 teachers. Some of them had less than 12 with me being the only teacher. Either way, it was about the same teacher to student ratio, BUT I noticed that in the smaller classes I taught, the children focused better and learned faster. I will NEVER forget one year that I had 26 4 yr old students. 18 were boys, 8 were girls. That was the most active class I have ever taught! My team teacher and I were stressed to the max for the whole year! So, if you can, look for a school with smaller class sizes (15 or less). You’ll be grateful you did! That being said, I should probably add that not every preschool is the same. If you find an awesome school with a bigger class size but the teachers are great and you feel good about it, then go for it! Even better, volunteer to help out! That way, you’ll get to know the teachers and see how the classroom dynamics are. I had to add this last part, because, even though smaller class sizes are a preference, I would hate for someone to miss out on a great school just because they might not have the smaller teacher to child ratio that you want. If you’re unsure, observe a classroom in action before you enroll. I hope you find the preschool that best suites your child. Good Luck! Thinking about teaching your preschooler at home? Read this post for some great tips!